Pallet Dolly for Pallets, Containers and Mesh Containers | SalesBridges B.V.
Pallet Dolly suitable for Pallets, Containers and Mesh Containers. 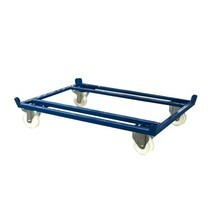 Equipped with 2 swivel castors with brake and 2 castor wheels. Welded steel profiles fitted with 4 support corner braces. Finished with powder coating RAL5010. 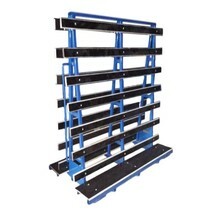 Pallet Dollies suitable for Pallets, Containers and Mesh Containers. 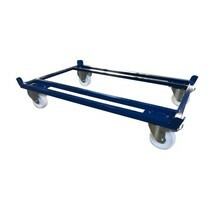 The Pallet Dolly is one of the popular internal transportation handling materials. Equipped with 2 swivel wheels with brake and 2 castor wheels. Polyamide or PU wheels. Welded steel profiles fitted with 4 support corner braces. Very robust and durable.